Three Gorgeous Hiking Trails to check out this Spring! Slowly but surely, spring is making its way into the city. After munching Christmas food, hibernation calories and the little extra we need when facing minus temperatures, a lot of us are ready to get rid of the holiday pounds and getting some fresh air! One of the nicest ways to do that is hiking. You get to see a whole new world when wandering through fields, forests and rock formations of this beautiful country. One gets into an peaceful state of mind when you find yourself in quietness – far far away from the city’s hustle and bustle. Now… Where do I go for that in the middle of the city? When asking people for suggestions, there is one place in particular that comes to their minds: Divoká Šárka! As magical as this place might be, after your 50th walk through it, you have to admit that you wouldn’t mind a little diversity. Due to Prague’s great public transport system, many of us don’t own a car – and there we have a hiker’s first problem: Where can I go for a hike if I only have one day and no car? We got the answers you have been looking for! Are you ready for a bosky experience next to the Vltava? A beautiful trail awaits you in Štěchovice, about 30 minutes bus ride from Prague. Vyhlidka Maj is a very popular destination for people to visit and when doing so, most of them totally miss out on what is on the other side of the river, down the gorge. From above one can spy the island you are going to have a wonderful picnic on! To get to this magical place, simply hop on bus 338, 360, 361 or 390 from Smíchovské nádraží and get off at “Štěchovice”. From the bus stop, simply cross the bridge and follow the street ahead. Though the beginning of your trail – passing a tennis court and a parking area – might not look so promising, keep the faith and mount the steep stairs up to where you see the forest claiming the land. You want to turn onto the trail that goes uphill to your right hand side and from there, you just follow the woody path along cottages, blossoming trees and small streams that cross your path. Not long and you are going to find yourself walking next to the waterfront, the pine trees providing shade from the glistening sun. This magical trail asks for a little climbing here and there, but have no fear: The few spots are totally non-climber-friendly and can be easily overcome. When going in spring, keep in mind that there might be some icy patches left. Cross them carefully, as the paths are narrow and the fall deep! As you follow the trail you come across a lot of cute places which are made to have a picnic in. You can either rest your legs on the rocks about an hour into your hike, while overlooking the Vltava and Štěchovice’s rocks towering on the other side of the river. If you prefer a table, have no fear: There is a picnic table just around the corner from the aforementioned rock formation. If you can wait with munching on your sandwich for another 20 minutes, follow the trail uphill to what almost looks like a little village of cottages, building the “entrance” to what feels like an island in paradise. This is THE place for resting, catching some rays and energy for the rest of your hike. If you feel like it, you might even pack something for a BBQ, for there are fireplaces on the island to use. When you are well rested, simply follow the trail leading away from the island (do not go up the stairs, those will only lead you to privately owned cottages). Instead, follow the waterfront for a good while until the trail goes slightly uphill and leads you directly to the rock formations; the main attraction of your hike! Not only do you get a wonderful view of the area, the rock formations themselves are a jewel! Now follow the rocky tunnel up and keep to the trail for another 30 minutes, till you get out of the forest and end as you started: With steep stairs uphill and up to the bus stop “Štěchovice, Třebenice”. Find the map for your hike here. Feeling less like uphill but still want to get your kilometers in? No problem at all! A very easy and extraordinarily relaxed trail awaits you in Dolní Počernice. To get there, take the yellow metro line to Černý Most and then change for bus No. 224 to the stop “Škola Dolní Počernice”. You will find yourself in a small village inhabiting a rather large pond with a small trail leading around it – just a step or two from the bus stop away! Start your walk with choosing whether you want to go to the left or right (as both trails will bring you back to where you started). To the right hand side, you can see an old bridge coming up which is definitely worth checking out and an ideal resting or picnic place in the area. During your walk you will find yourself surrounded by not only fishes in and birds around the pond but also green trees, blossoming flowers and a lot of spring sun! Promenading through the partially woody part of the walk, you get some magnificent views of the area, its fields and animal wildlife. Especially on a warm spring day, this place is buzzing; bees, swans and mice are enjoying the sun as much as you are. A perfectly peaceful place! Whenever you feel like you have had enough solitude and feel slightly thirsty – there is a place near the river that has draft beer, Malinovka, Kofola and snacks available. Find directions to your next walk right here. Thought you couldn’t? Yes, you can! A lot of people tend to not visit Bohemian Paradise for a day because they do not own a car. Let me tell you: The train works just fine. Though you might not get to see all of what this area has to offer, you might find a treasure no one else ever gets to see because they are driving past it on their way. Your hike starts in Mnichovo Hradiště. To get there, jump on the direct train towards Turnov and get off at “Mnichovo Hradiště”. From here, cross the train tracks and jump right into wild nature! Your biggest indicator is the wheat field arising at the end of the long main street you are walking on. Once you get onto the trail, which is surrounded by corn, you are pretty much set for the rest of your journey. Follow the trail which passes little ponds, a beehive and then takes a rather steep turn up into a forest. When you get to a crossing, turn to the right to get to the gorgeous Valečov Castle (Zřícenina skalního hradu Valečov) – a hidden jewel people come across when hiking in this area! Valečov was built in the 14th century on a sandstone rock. Partially situated in the rocks, the castle got an extension in the 16th century. 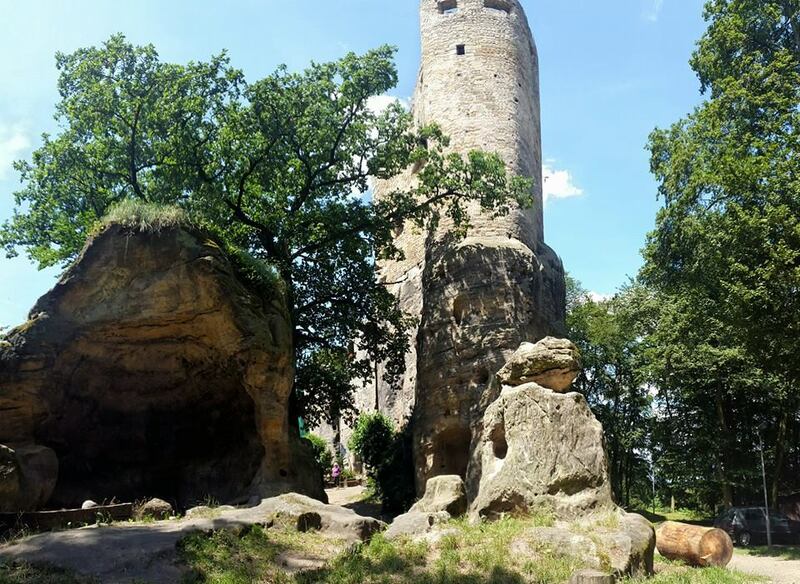 It is considered to be one of the most beautiful rock castles in Czech Republic. From here, follow a narrow trail through the forest behind the castle and keep to the path all the way through the pine forest. This part will take you about 1.5 hours and lead you through a village-like area with cute, old cottages, past streams, blossoming fields and trees. The last bit will take all the energy you got left but the view and resting on those rocks will be all worth it! Are your feet itching yet? Find directions right here! The gorgeous view from Příhrazské skály! Always – I can not stress it enough – always show the bus driver or the lady in the train station your Lítačka card or your monthly ticket. Often, you get a discount on your ticket because some of the stops you pass are included in your transport ticket. Some of the buses going to nearby places might the be free or as cheap as CZK 48.00 for a return trip! Do not rely on supermarkets being around these places. Pack a nice lunch that will keep you going for your hike. Too often there are no supermarkets around and you either have to get out of your way to get to one or if you are unlucky, the closest thing to a supermarket is a corn field towering on the right side of your hiking trail. Invest the extra 10 minutes to make sandwiches so you don’t go hungry. And hey! What is better than a picnic overlooking the beautiful Czech countryside? Let’s not forget to take care of what we love: Nature. Clean up after yourself and don’t leave any packaging, trash or alike behind, so the next hiker following your steps can enjoy the area as much as you did when having your break! Leave animals alone and respect closures – certain trails are closed for a reason. Most importantly: Enjoy the day out and relax! Hey, I just discovered your blog and it is great! I am living in Prague for six years now and still rediscovering her beauty every day. Thanks for your valuable information and your inspiration!